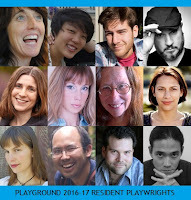 PlayGround Blog: PlayGround's 2016-17 Writers! 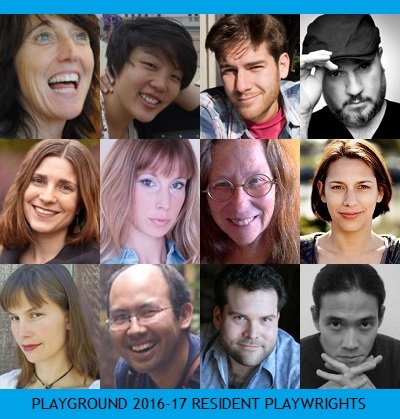 PlayGround has announced the thirty-six playwrights selected for the 2016-17 PlayGround Writers Pool and the twelve alumni selected for the 2016-17 Resident Playwrights Program. Over the next six months, the Writers Pool will generate more than 180 original short plays inspired by monthly prompts as part of the Monday Night PlayGround staged reading series performing at Berkeley Repertory Theatre. The top six plays each month will receive professional script-in-hand staged readings led by leading Bay Area directors and actors. At the conclusion of the season, the best works will receive full production as part of the annual Best of PlayGround, now going on its twenty-first year. Through the Resident Playwrights Program, PlayGround will support the development of more than a dozen new full-length works, including six new or ongoing commissions. Four plays competitively selected from among these works and other alumni submissions will receive two-week developmental workshops and public staged readings as part of the annual PlayGround Festivalof New Works at Thick House Theater next May. PlayGround officially kicked off its 23rd season on Monday, September 19th, with a special Monday Night PlayGround “Alumni Night” featuring six short plays around the topic of “The Potrero Nuevo (New Pasture) Project” which focused on investigating the rich and complex history, present and future of Potrero Hill, where PlayGround now operates the 80-seat Thick House Theater. Those works are now undergoing further development and will premiere as part of a fully-produced evening-length program at the soon-to-be-renovated and renamed Thick House in January 2017. The next Monday Night PlayGround is Monday, October 17 at Berkeley Rep, with six plays on an environmental topic to be announced, as part of the third annual Planet Earth New Play Festival. The remaining Monday Night dates are: November 21 (“Musical Theatre Night”), December 19 (“Holiday Extravaganza”), January 16 (“S.T.E.M. Night”), February 20 (“Social Justice Night” in partnership with Lorraine Hansberry Theatre and San Francisco Mime Troupe), and March 20 (“Women’s Arts Night”). Tickets are on sale for all performances and six-event subscriptions begin at $60. For more information and tickets, visit http://playground-sf.org/monday. PlayGround, the Bay Area’s leading playwright incubator, provides unique development opportunities for the Bay Area’s best new playwrights, including the monthly Monday Night PlayGround staged reading series, annual Best of PlayGround Festival, full-length play commissions and support for the production of new plays by local playwrights through the New Play Production Fund, among others. To date, PlayGround has supported more than 200 local playwrights in the development and staging of 750 original short plays and 61 new full-length plays, including 21 that have since premiered in the Bay Area. PlayGround’s alumni have gone on to win local, national, and international honors for their short and full-length work, including recognition at the O’Neill National Playwrights Conference, Humana Festival, Sundance Festival, The Lark, Bay Area Playwrights Festival, and New York International Fringe Festival, among others. Their works have been premiered at numerous theatres throughout the Bay Area, including: A.C.T. Costume Shop, Shotgun Players, Impact Theatre, Theatre Rhinoceros, San Jose Stage Company, Just Theater, and San Francisco Playhouse. For more information, visit http://playground-sf.org.